Picking a lucky wedding day is pretty much the ONLY reason I would personally ever have a St. Patrick's Day wedding, and even that would never be enough to convince me. 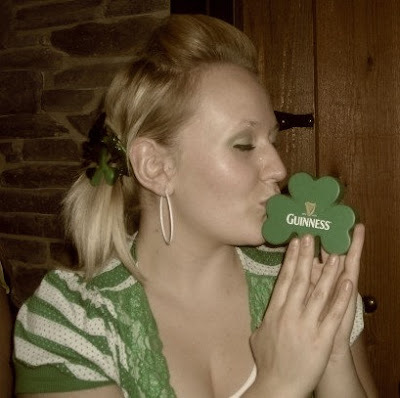 I like different, but I am not a fan of using your wedding day to stock up on four leaf clover garland at the dollar store and make a mockery of such an important life event. This being said - I know there are people who do choose holidays for their wedding, and this is okay too, but having the holiday as an accent and not front and centre is the key to pulling this one off. 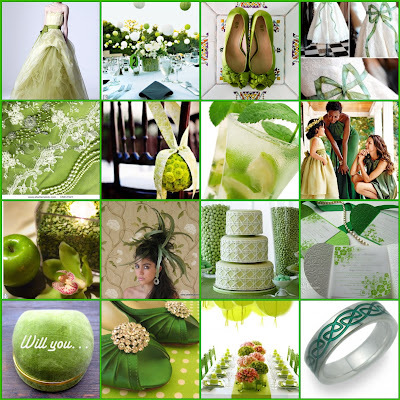 I have taken this opportunity to show you some beautiful pieces to accent a green wedding, but maybe why you wouldn't want to have an all green wedding day. I don't know, I am not a fan of the palette below, but rather pieces within it. The Vera Wang wedding gown in the top left corner? Wow. I love Vera Wang and as soon as I saw this hot little number, I knew she must be the mastermind behind it. I love her whimsical, fluffy tulle dresses, and that she makes hers in a few different shades, light green, light peach. I will never give up my white or ivory dress, but absolutely adore seeing them on brides. So fun! Whatever you choose, just make sure your wedding day is true to yourself, timeless and something you know you'll look back on in fifty years and still think it was the most beautiful day of your life.